Don't let their name fool you. 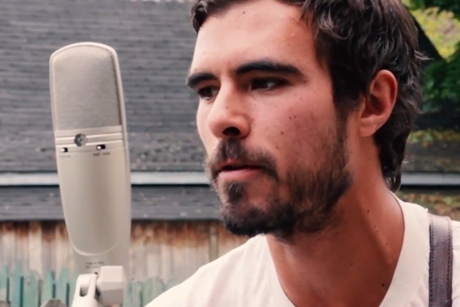 Calgary's Reuben and the Dark are much more aligned with uplifting, inspiring feelings than one might think. Led by frontman Reuben Bullock, the band has garnered the attention of many from coast to coast through their folk-pop blend, gorgeous vocal harmonies and healthy amounts of hooks. We invited the group to the Exclaim! office for a performance of "Devil's Time," taken from their 2014 debut record Funeral Sky. Tapping out the opening rhythm on the stairs of the fire escape, the track begins with an ominous beat delivered on a solitary drum. It isn't long until the aforementioned uplifting melodies appear in the form of twin guitar acoustic noodling and strumming. Bullock delivers his vocals in a calm and collected manner, which is an interesting contrast to the lyrical subject matter. "I went walking on the devil's time, with nothing but shadow from the other side," he sings in the chorus section, before two of his bandmates join him in unfailingly inspired vocal harmonies.